Actor William Daniels was in studio for TCM last month for an interview with Ben Mankiewicz. Daniels will be one of TCM's guest programmers in 2017. In a career which has spanned sixty years, Daniels has done as much or more as anyone in his business. He has appeared numerous times on the big screen, variously as Dustin Hoffman's dad in THE GRADUATE and President John Adams in the musical 1776, a role Daniels had originated on Broadway. In the 1980s, Daniels won two Emmy Awards for his supporting role on St. Elsewhere and simultaneously provided the voice of the car on TV's Knight Rider. He subsequently played the school principal on the long-running ABC sitcom Boy Meets World from 1993 to 2000, a role he has reprised briefly on the Disney Channel follow-up Girl Meets World. Daniels also served as the president of the Screen Actors Guild from 1999 to 2001. William Daniels is pictured above at a screening of 1776 at the 2015 TCM Classic Film Festival. 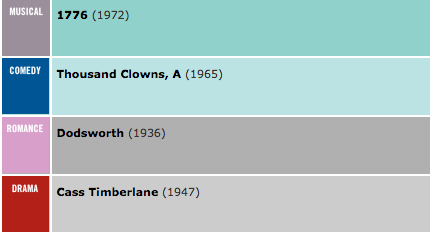 I like that the first two selections are films he appears in. Surprised he didn't pick THE GRADUATE as well. Yes. I'm sure he has interesting stories about working on these movies. He's also in the Audrey Hepburn/Albert Finney classic TWO FOR THE ROAD, and he has a fairly substantial supporting role in it. That would have been another great choice. Yes, he should have added "The Graduate" and "Two For The Road". I remember Boy Meets World (1993-2000) when it was on the Disney Channel. I did not know that he was in that show. I have not watched Girl Meets World, but I imagine that it is similar to its predecesor. He's in all 158 episodes of the series.